Anti-semitism, racism, xenophobia and religious intolerance “are deeply entrenched” in political parties currently opposed to the Maldivian Democratic Party (MDP), former Foreign Minister in both Nasheed and Gayoom’s government, Dr Ahmed Shaheed, has said. Dr Shaheed’s comments follow reports in local media summarising US Embassy cables first published by Wikileaks in 2009, and discussed during the then-opposition parliament’s efforts to impeach the foreign minister. In particular, the Maldivian government’s engagement with Israel was the subject of a parliamentary debate November 9, 2009, in which Shaheed narrowly avoided impeachment following a no-confidence motion. 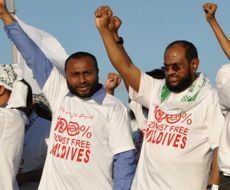 Opposition to the Maldives’ recognition of Israel was seized by then opposition groups in December 2011 as a sign of the Nasheed government’s “anti-Islamic” policies. The previously disparate parties formed the ‘December 23 coalition’, following a large rally in Male’. “The growth of extremism itself has numerous causes, but none of it is linked to government policy towards Israel or Palestine,” he added. Many Maldivians firmly believe that policies pursued by Israel affect their solidarity with Arabs and other Muslims, Dr Shaheed explained. “We care about how Israel treats the Palestinian people, because we care about the safety of the Muslim holy places under Israeli jurisdiction, and because we need to have a dialogue with Israel communicating our interests and concerns on these matters regularly,” he said. Dr Shaheed “highlighted that former President Nasheed pledged to “renew ties” with Israel in his September 24 (2009) UN General Assembly speech,” that the Maldives Defense Minister and Minister for Natural Disasters would visit Israel later that year, and both nations “have already signed agreements on health, education, and tourism”. “Many in the Maldives see the Palestinian-Israeli dispute in religious terms, and religious sensitivities are played up during election time,” he added. The Ministry of Foreign Affairs meanwhile told Minivan News the Maldives is “not against Israel”. “The Maldives’ government always supports Palestinian citizens to have their freedom and urges this in the United Nations,” said Foreign Ministry Spokesperson Muaz Ali. “This does not mean Maldives is against Israel,” he said. “Neither former President Maumoon Gayoom nor former President Mohamed Nasheed divided the world into a Dar al- Harb and a Dar al- Islam as in classical Islamic international relations theory, which is what the Salafists in the Maldives want to do,” stated Shaheed. Shaheed explained that “anti-semitism runs deep in certain sections of Maldivian society”, highlighting as an example an article published in Dhivehi on local news website Dhi-Islam in January 2011, reporting on the agreements made between the Maldivian and Israeli government. “Under this heinous agreement, these people have thrown the little children and the youth of the Maldives, as well as the country’s education sector and the health sector and many other matters, into the lap of the evil Zionist Israelis, who, as we have been informed through the seven heavens, will never wish anything but evil for Muslims,” the article reads. “Jews have even historically been an evil people who have been cursed because they had killed prophets and spread corruption on earth, and that they are the biggest enemies of Muslims is proven by the teachings of the Holy Quran and forms of the core beliefs of Muslims. This agreement will impose pressures to prevent the dissemination of these teachings,” it adds. “This agreement is high treason or the highest form treachery against the noble Islam and Maldivian identity, upon which this country is founded. It is a matter far more dangerous and grave than can be treated lightly,” said the report. There is no document to support the claim that Maldives ever severed diplomatic relations with Israel, in Maldivian or Israeli records, explained Dr Shaheed. Instead, what appears to have happened is a downgrading of the relationship where no Maldivian president since the early 1970s has been willing to receive an Israeli ambassador formally in his office. The Maldives voted at the UN to accept the legitimacy of Israel, on December 17, 1991, at the request of then President George Bush, by repealing the 1975 UN resolution equating zionism with racism. “The Maldives was not alone in changing its policies towards Israel – there were a number of Organisation of Islamic Cooperation (OIC) states doing the same thing, or had even restored full diplomatic relations,” said Dr Shaheed. “Under Gayoom, the Maldives categorically accepted the two-state solution. All of these actions were firmly grounded in international law and state practice,” he added. The Maldivian government discussed the question of restoring ties with Israel following the Oslo Accord agreement in 1993, which established a peace process framework to resolve the Palestinian-Israeli conflict. Israel agreed to recognize Yasser Arafat as its partner in peace talks and essentially exchanged land for peace. The Palestinians in turn recognized Israel’s right to exist while also renouncing the use of terrorism and its long-held call for Israel’s destruction. The Gayoom cabinet agreed on a three-stage restoration of ties with Israel, beginning in June 1994. The Maldivian government “agreed to recognize Israeli passports and ended the travel ban” during stage one, explained Shaheed. Shortly thereafter stage two saw trade and commercial relations were fully restored. Restoring political ties occurred during stage three, with regular meetings at senior diplomatic levels, between 1995 to 2008. “So what President Nasheed said at the UN – and that was my formulation – was that Maldives wanted friendly relations with all states in the General Assembly,” said Dr Shaheed. “This does not and has not prevented Maldives from criticizing actions of UN member states when they violate peremptory norms of international law, but Nasheed was not going to divide the world into the good the bad and the ugly,” he declared. In recent years, attitudes toward Israel have greatly fluctuated with collaborative engagement by the Maldivian government being countered by some anti-semitic ‘blowback’ from elements within Maldivian society. In February 2010, a team of experts from the Israeli Foreign Ministry are training 35 Maldivian officials in emergency preparedness, with a focus on the management of mass casualties. Later that year, in November, the Islamic Foundation of the Maldives (IFM) called on the government to break off all diplomatic ties with Israel, a day after Indira Gandhi Memorial Hospital (IGMH) announced that a team of seven Israeli doctors is due to arrive in the country to treat patients at the government hospital for a week. The following month, Founders of the IFM NGO claimed that although they do not believe in “hysterical outbursts” and theories of an imminent “Jewish invasion” in the country, a week of anti-Israel protests and flag burning across Male’ has reflected “strong dissatisfaction with the government’s open attitude” to the Jewish state. In May 2011, Ahmed Naseem became the first Maldivian Foreign Minister to visit Israel. However, in September 2011, Deputy Leader of the Adhaalath Party Dr Mauroof Hussein has called for alarm after alleging that a delegation from an Israeli company, Teshuva Agricultural Products, was due to arrive in the Maldives to assess the country’s agricultural potential. The Israeli agricultural delegation that was supposed to arrive on Filadhoo cancelled the visit after the islanders warned that they would not let the delegation go further than the jetty. In December 2011, Minister of Islamic Affairs Dr Abdul Majeed Abdul Bari requested parliament endorse a resolution forbidding the government to establish ties with Israel. While in April 2012, MPs passed a resolution preventing Israeli national airline El Al from operating scheduled flights to the Maldives until Majlis’ National Security Committee completes further investigation into the matter. El Al applied to the Ministry of Civil Aviation in May 2011 requesting permission to fly to the Maldives starting in December 2011. There was no direct flight from Israel to Maldives between 2009-2011, so the Maldives was “not able to maximize the benefits from the growing Israeli market,” Dr Shaheed remarked. “Maldives could have significantly increased the direct income and benefits from Israeli tourism by accepting direct flights from Israel, resulting in a longer holidays and greater expenditure in Maldives while still making the holiday comparatively cheaper for the visitor,” he added. President Obama and Secretary of State Hillary Rodham Clinton have made it a priority to reinvigorate America’s relationships around the world. They have been working hard to strengthen our existing partnerships and build new ones to meet shared challenges, from climate change to ending the threat of nuclear weapons to fighting disease and poverty. As the United States Ambassador to Maldives, I’m proud to be part of this effort. Under the leadership of President Obama, we have greatly expanded our engagement in Maldives. We have strengthened our security cooperation, and we have broadened our mutual efforts on climate change (including $3.5 million from our development agency, USAID). As a sign of this growing friendship, Farah Pandith, the first ever US Special Representative to Muslim Communities, visited the Maldives just last week, where she met ordinary citizens and government officials. In the past few days, documents purportedly downloaded from US Defence Department computers have become the subject of reports in the media. I cannot vouch for the authenticity of any one of these documents. But I can say that the United States would deeply regret the disclosure of any information that was intended to be confidential. And we condemn it. Diplomats must engage in frank discussions with their colleagues, and they must be assured that these discussions will remain private. Honest dialogue—within governments and between them—is part of the basic bargain of international relations; we couldn’t maintain peace, security, and international stability without it. People of good faith will recognise that diplomats’ internal reports do not represent a government’s official foreign policy. In the United States, they are one element out of many that shape our policies, which are ultimately set by the President and the Secretary of State. And those policies are a matter of public record, the subject of thousands of pages of speeches, statements, white papers, and other documents that the State Department makes freely available online and elsewhere. But relations between governments aren’t the only concern. US diplomats meet with local human rights workers, journalists, religious leaders, and others outside the government who offer their own candid insights. These conversations depend on trust and confidence as well. In some countries, if an anti-corruption activist shares information about official misconduct, or a social worker passes along documentation of sexual violence, revealing that person’s identity could have serious repercussions: imprisonment, torture, even death. The owners of the WikiLeaks website claim to possess some 250,000 classified documents, many of which have been released to the media. Whatever their motives are in publishing these documents, it is clear that releasing them poses real risks to real people, and often to particular people who have dedicated their lives to protecting others. We support and are willing to have genuine debates about pressing questions of public policy. But releasing documents carelessly and without regard for the consequences is not the way to start such a debate. For our part, the US government is committed to maintaining the security of our diplomatic communications and is taking steps to make sure they are kept in confidence. We are moving aggressively to make sure this kind of breach does not happen again. And we will continue to work to strengthen our partnership with the Maldives and make progress on the issues that are important for our two countries. We can’t afford anything less. I am in close contact with President Nasheed to make sure we continue to focus on the issues and tasks at hand. President Obama, Secretary Clinton, and I remain committed to being trusted partners as we seek to build a better, more prosperous world for everyone. Patricia A Butenis is the US Ambassador to the Democratic Socialist Republic of Sri Lanka and the Republic of Maldives. A mysterious 1.4 GB encrypted file named “insurance” has appeared on the WikiLeaks Afghan War page that released tens of thousands of secret documents last Sunday. The “insurance” file is also available for download through bittorrent. 200,000 pages of secret US military files concerning the war in Afghanistan have been released by the whistleblowing site Wikileaks, and simultaneously published online by the UK Guardian, US New York Times and German Der Speigel. The news organisations have been examining the documents for weeks, after receiving them from Wikileaks which is headed by Australian Julian Assange.